Left: President Roosevelt re-planting one of the two original navel orange trees in front of the Mission Inn, May 8, 1903. Right: The lobby of the new Mission Inn, in 1905 after complete reconstruction of the original Glenwood Hotel by Frank Miller. Frank Miller came to Riverside as a 17 year old. His father, Captain Christopher Columbus “C.C.” Miller, had been drawn to the town to work on the surveying and construction of a canal for the New England Colony, led by S.C. Evans. That work fueled a confrontation between Evans and Riverside’s founder, John W. North, over rights of way for the canal and, in turn, led to the takeover of the Southern California Colony Association by Evans’ group. On January 23, 1877, the Southern California Colony Association, now under Evans, sold Miller and his son-in-law, G. O. Newman, Block 6, Range 6, of the Town of Riverside for $250. The block was bounded by Main Street, Sixth Street, Orange Street, and Seventh Street. The home they built, called Glenwood Cottage, grew to take in paying guests. The first paying guest was Albert S. White. In 1878, Miller and Newman built a large addition and the building became the Glenwood Hotel. On August 29, 1879, Miller bought Newman’s share for $3,280. On February 4, 1880, C. C. Miller and his wife, Mary, sold the property to their son, Frank, for $5,000. Frank was fond of a young lady in Wisconsin when he arrived in Riverside but slowly became enamored of Miss Annie Eastman. That she was “glacially cool” toward him, made Miller consider her sister, Lilly. By 1877 there was increasing mention in his diary “of the schoolteacher, Isabella (Bell) Hardenburg …. Frank began to pay more attention.” When she returned in the fall, Bell boarded at Glenwood Cottage. 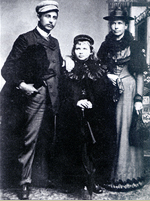 By the spring of 1878, Bell Hardenburg had come to see the Millers as her adopted family. Frank, now a foreman for the Sunnyside Ditch Company, placed all his romantic ambitions on her. The two were married on June 8, 1880. In 1880, having sold his orange grove, Frank acquired the block of land with the family home from his father for $5,000. Four months later, the landmark hotel across the street burnt to the ground; business improved with the lessened competition. Immediately after acquiring the property Miller landscaped the grounds and planted pepper trees around the block. In 1882, at a cost of $10,000, he built a “large… wooden, two-storied plain addition” to the west side of the adobe home, “extending towards Main Street and adding thirty new guest rooms with openings onto side porches.” That same year he leased the Park Boarding House near the city park, furnished and operated it. Although Miller advertised it vigorously, the hotel’s early years were difficult. In 1885 he leased the “Glenwood Cottages,” as the hotel was then called, to his sister Alice and her husband, Frank W. Richardson. The regular hotel advertisement had an addendum “For Sale. Hotel Glenwood Property. Furniture and Business is offered for sale at a bargain as the proprietor wishes to retire from the hotel business.” In all probability Miller intended to concentrate on the booming real estate market, but his reputation as a hotel man kept after him. For almost three years Miller and his wife Isabella “managed the Hotel Palomares in Pomona. When this hotel was greatly enlarged in 1887, he took a new job as agent to organize and develop the boom town of Claremont ….As the real estate boom began to fade … he returned to Riverside to help organize the building of the Loring Block” and resume his other responsibilities. A little known guest of the Glenwood in the 1880s, Wilson Crewdson, had a significant impact on Miller and the Riverside community. A wealthy Englishman and former director of Oriental exhibits at the British Museum, Crewdson came to Riverside for relief of a lung ailment. “According to Miller’s biographers, Crewdson’s casual conversations with the proprietor of the Glenwood Hotel—about art, history, and culture—left an indelible impression on Miller. The erudite and sophisticated Englishman inadvertently broadened the horizons of an energetic but parochially trained young man. Crewdson left Miller with a growing desire to collect, incorporate in the hotel, and dramatize the best of the world’s art and spirit. Along the way, Miller almost single-handedly transformed a city’s tastes, inspiring it to nearly make itself over.” Crewdson was later to play a significant role in Riverside’s future as a member of the Riverside Trust Company, the group that ended up controlling the Gage Canal and Arlington Heights development. Miller had formed a real estate partnership with Albert S. White, a wealthy New Yorker. “When the Loring Block was finished they moved their real estate office into the corner room of the main floor and served as agents for the corporation which owned the building.” Miller had learned a great deal from his friendship with Charles Loring, a businessman from Minneapolis who first visited the Glenwood in 1886. He was a “strong proponent of civic beautification, particularly through parks and street trees,” and a natural ally for Miller. By the end of 1887, Miller seemed reconciled to maintaining the Glenwood and concentrating on his efforts in Riverside. In 1888 the Glenwood was again expanded; with these changes and the cottages added on the east side of the hotel block two years earlier, the hotel remained essentially the same until 1902. In November 1889 Miller proposed a city ordinance that in hotels with 40 or more rooms, the sale of wine and beer was permitted with meals costing at least 25 cents. When the ordinance went into effect, only Miller’s Glenwood Tavern qualified for a liquor license. No saloons were permitted. Drug stores were allowed to sell alcohol, however, and a brisk covert trade developed—not at all pleasing to the ladies of the Women’s Christian Temperance Union or the Puritan-stock members of the First Congregational Church. 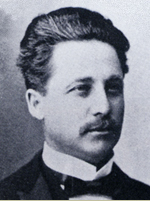 In 1889 Miller became one of the Directors of a stock company incorporated to build the Loring Opera House, named for the long time guest at Miller’s hotel. For 16 years, Miller managed the Loring Opera Company and added the local venue to the California opera circuit. In 1891 Miller also contracted to manage the San Bernardino Opera House. In 1891 Miller became a stockholder in the Orange Growers Bank, broken in an embezzling scandal by H.T. (Tom) Hays. Bank directors W.S. Sweatt and Gaylor Rouse are also buried at Evergreen. Miller also served as a member of the Board of Directors of the Rubidoux Club, the club of Riverside’s most important businessmen. In January, 1894, the city faced the problem of local unemployment; city trustees gave meal tickets and lodging to transients needing work in exchange for labor paving and grading Riverside streets. Residents—half of the labor pool—were paid a dollar a day. By March, the cost of the labor pool seemed prohibitive. Miller argued strongly that he would rather shut off city services than release the men, and suggested that they pave Main Street. In 1894 Miller incorporated The Glenwood Hotel Company; not until 1902 was he able to secure capital and build the new structure he envisioned, the “Glenwood, California’s Mission Hotel.” In 1902, Gaylor Rouse was a director of the company and owned five shares of stock, helping to capitalize the venture. On April 22, 1895 the city celebrated a good orange crop with “Orange Day” proposed by Miller, who arranged special trains and fares to bring people in. “Welcome to the Glenwood Tavern” was written in oranges on the front lawn. In September 1895 the paving of Main Street, from 6th to 10th began—with asphaltum which was preferred to macadam. The remaining 13 blocks to the Santa Fe tracks was to be paid by the city and property owners. The work was not well done: horses slipped and fell; large ruts and holes were carved out by wagon wheels against the inferior underlayment (trustees had stipulated this be dirt rather than rock). Cement sidewalks and granite necessitated the removal of tall eucalyptus and cypress trees. Frank Miller offered the trustees a list of donors willing to buy North Hill Quarry to supply rock for future street work. S.C. Evans offered 12 acres of adjoining land and water rights for a lake to make a city park; he was feted by the city at the Glenwood Hotel. While the street paving was going on, Miller ensured all the walks and driveways of the hotel block were paved with asphalt. “Earlier that year he had installed tennis and croquet courts, pool and billiard rooms, and enclosed and roofed a south veranda with glass so that his eastern guests could sunbathe in winter.” Miller’s brother acquired a large carriage to convey hotel guests and the picnics Miller arranged for their all-day outings. Lights went on in Riverside in October 1896; 74 street lights shone downtown and along the first mile of Magnolia Avenue. Within weeks electricity also came to the Glenwood Hotel where 130 lights were installed. Miller, manager of the Riverside and Arlington Street Railway, began to look for a way to electrify the city’s streetcar line. Increasingly famous as a hotel man, in 1896 Miller became president of the Southern California Hotel Men’s Association and had much to do with its national affiliate. From 1894 to 98 Miller made repeated attempts to build a new hotel including one proposal to build a 200-room hotel with a courthouse wing. During this time he leased the Hotel Arcadia in Santa Monica, landscaped and managed the hotel while his sister and her husband ran the Glenwood Tavern. From April 14th to 21st, 1900 Riverside marked her prosperity with a “Street Fair and Water Plentitude Celebration.” Frank Miller had proposed the festivities to the city trustees after borrowing the idea from a San Francisco guest; the city hired the guest to manage the affair and appointed Miller in charge of attractions. On January 11, 1901 the city fathers adopted a “No Spitting Ordinance.” Frank Miller managed the local street car system and urged the bill to keep the cars clean from tobacco chewers. He distributed a thousand copies of the ordinance. In May 1902 Miler filed the incorporation papers of the Glenwood Hotel Company and began moving the buildings on his hotel block. When the shareholders came up short, Henry E. Huntington agreed to invest $75,000 in the property patterned after the Hotel Colorado at Glenwood Springs. Walls of the new construction were of concrete, the ceiling cement tile; in 1900 Miller had lost 14 rooms and part of the kitchen to fire and was determined to protect his property. Work was scheduled to be complete in January 1903, but heavy rains would prevent that. 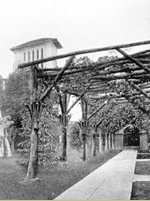 In late July 1902 Miller, his wife Isabella and daughter Allis left on a six-week trip to the east to purchase furniture and visit prototypes for the new buildings. When they returned, Miller incorporated the changes. The first guests of the new hotel arrived in January 1903 although building details were unfinished. The formal opening of the new Glenwood was February 20, 1903, and the public was invited to view the rooms and grounds. In charge were Miller, his brother in law Richardson as Manager, his daughter Allis as private correspondent, his brother Ed as head liveryman, and his sister Alice (Mrs. F.W. Richardson) as buyer. On May 7, 1903 President Theodore Roosevelt was a guest at the hotel, on a tour for reelection. In the hotel’s courtyard he planted one of the two famous parent navel orange trees. The tree died in 1922, and Miller had it cut up for souvenirs. Like Roosevelt, Miller was a Prohibitionist. There were no bars in the Mission Inn when he was alive. In February 1904 Frank Miller was included as one of the directors of the new Victoria Country Club; with 43 other businessmen, he was one of the original stockholders. Miller was convinced the automobile would play an important part in parklands and opportunity for people to enjoy them. In 1906, when the city failed to undertake the work, Miller—along with Henry Huntington and others formed the Huntington Park Association and paved the four-mile road up Mt. Rubidoux. In the spring of the year Miller built his large, Spanish style Glenwood Mission Garage, built on prototypes he had inspected in the east. He acquired 10 Stearns automobiles and charged people a dollar for a trip up and down the mountain (with larger fees for longer trips). Driving became less of a problem in 1906 when the city began to install street lights; Miller was among those who determined the design. With his connections Miller was able to go to Washington to “get Senator Flint to get Colonel Chittenden, the US Army engineer who laid out the Yellowstone Park road, to lay out” the road to the top of the hill. The road up Mount Rubidoux was paved with $50,000 of Huntington’s money as a part of a demonstration project of the new asphaltum paving technique and unveiled at a conference Miller hoisted at the Mission Inn on April 27, 1907. The conference launched the “Good Roads Movement” regionwide and was attended by the publisher of the Los Angeles Times, two presidents of transcontinental railroads, college presidents, trolley magnates, and leading men of the church. The conference eventually led to a bond measure, passed by voters in 1913, to build roads countywide. One of the conference’s entertainments was a car trip up the road to the top where a new cross was dedicated by the Roman Catholic bishop of Monterey and Los Angeles. Jacob Riis, famed journalist and social worker who spoke at the road’s opening, suggested the idea of an annual Easter sunrise service; the first service was held in 1909 and “sparked a wave of similar … services across the nation.” About 100 people attended the first sunrise service on Mt. Rubidoux; crowds varied in size over the years, but the largest—of over 20,000—attended in 1922. When the Millers returned, they began the Cloister addition to the northeast corner of their hotel. The work was complete in 1911 and celebrated with an elaborate dinner. A small leaflet included a lengthy list of beautiful improvements and articulated in detail specific points of comparison to the California missions; it established the name “Mission Inn” for the hotel. During this time, Miller’s first wife Isabella suffered a lengthy illness and died. A leaded glass window was dedicated to her memory in the Music Room of the Cloister Wing. On December 8, 1911, in New York City, Miller married his secretary Marion C. Clark; he was 54, she was 26. Presidents as well as the barons of business enjoyed the Inn. In the early days these included Benjamin Harrison, William McKinley, Theodore Roosevelt, Taft, and Herbert Hoover; in later years it included both Nixon and Kennedy as well as Ronald Reagan, who honeymooned there with Nancy. “The cause of world peace was associated with both the mountain and the Inn… [Miller] staged a peace conference in Riverside in 1911 with the help of the Andrew Carnegie Peace Foundation and a number of prominent men …. In 1919, a year after the end of WWI, he associated the peace theme with Mt. Rubidoux by starting an annual Armistice Day … sunset service.” Each year in the 1920s a different country was honored; in 1923 it was Japan. More than just a concern for the devastation of an earthquake, Miller, his guest David Starr Jordan, the vice consul for Japan, presented an engaging program. “Miller, his wife and sister Mrs. Richardson, spent much of 1925 visiting in the Orient … bringing back objects and curios for sale and ideas for more building in the Inn. … what surely must be the world’s first tile-roofed pagoda, was one result,” another was the Peace Tower and bridge. Years before he went to Japan or brought back art treasures for the Inn, Miller’s friendship with the Japanese men, many of whom arrived seeking work between 1900 and 1910 and later brought their families, had a significant impact on Riverside’s acceptance of the immigrants. “The Japanese were treated better in Riverside than in other California cities because of Frank Miller’s friendship.” One particular instance stands out. Jukichi Harada and his family worked at several different jobs. Mr. Harada bought a house in December 1915 and recorded the title in the name of his first three children born in the US (California law in the early 1900s prohibited the Japanese from owning property; Mr. Harada, his wife and eldest son were born in Japan.) People who disliked the Japanese, others who were unhappy that the Haradas had bought the house or thought it was unlawful for them to own it filed suit in California Supreme Court. “Frank Miller was very helpful to the Harada family during this time. … In 1918 the California Supreme Court ruled that the Harada children could own the house because they were American citizens.” In 1948 California and the US Supreme Court threw out the law prohibiting Japanese from owning property. The Harada house became famous throughout the US; today it is a Riverside Cultural Landmark and listed in the National Register of Historical Places.